Gas assist injection molding gives engineers the freedom of design to mold intricate parts with less material. In plastic injection molding, maintaining even pressure within the mold cavity is vital for creating a high-quality part. Conventional injection molding uses the liquid medium (melted plastic, resin, etc.) to pressurize the material within the mold cavity, forcing the liquid material to the edges of the mold to achieve the desired shape. Using the material to pressurize the mold, however, has drawbacks, and it can lead to inconsistent pressure, resulting in product abnormalities. Gas Assist Injection Molding, an alternative version of plastic injection molding, leverages nitrogen to pressurize the mold instead. The manufacturing technique has been around for more than 20 years, although it has not been adopted uniformly. Goralski and his colleagues within the Plastics Technology Group at Bauer Compressors literally wrote the book on gas assist injection molding. Involved with plastic injection molding for more than 20 years, Goralski has helped many manufacturers implement gas assist to reduce material waste, shorten cycle times, and improve product quality. To learn about how Bauer Compressors helps plastics manufacturers, we spoke with Goralski and his peer Dennis Paul of Bauer Compressors. During our discussion, we talked about the advantages of gas assist injection molding, and learned about Bauer’s on-site nitrogen generation systems. During the traditional plastic injection molding process, a cavity is filled with molten resin. Once injected, the cavity is pressurized as the plastic cools, typically with hydraulic force generated by packing more resin into the mold through a material feed gate. Maintaining the pressure through a feed gate can be exceedingly difficult, depending on the geometry of the piece. Injection molded parts can experience freeze off—or the solidification of the resin within the mold—before the piece is fully formed. Uneven pressure and freeze off can cause defects, especially in parts with thin-wall designs, heavy bosses (a configuration of the part that intersects with a wall) and ribs. These added complexities inside the mold make it difficult to achieve the proper form before the resin freezes off, leading to sink marks, or depressions in the surface of the part. Gas assist injection molding helps eliminate the quality issues inherent to conventional injection molding, because nitrogen is used to push the resin to the ends of the mold. A pre-selected amount of resin is injected into the mold, followed by nitrogen, which fills the cavity from inside the resin, leaving a designed void in the middle of the part (Figure 1). The void eliminates a significant amount of resin waste, and the evenly applied gas pressure helps to reduce shrinkage and warpage during cooling. With less mass to cool at the end of the process, gas assist can shorten cycle times as well. Figure 1: Gas assist injection molding creates a designed void within the plastic part, eliminating wasted resin and improving part quality. Initially, plastic injection molders adopted gas assist for economic reasons—namely reduced cycle times and less material waste. To make the most of the technique, manufacturers targeted thicker parts that required longer cycle times. During the 90s, one of the biggest growth periods for plastic injection molding, manufacturers yielded substantive savings by switching to gas assist injection molding for products like large plastic bins, thick handles, TV enclosures, and cumbersome automotive parts. Structural foaming is a time-intensive method of plastic injection molding that blends a chemical foaming agent with the heated material before it enters the injection chamber of the machine. It is used for thicker parts, and the foaming agent effectively reduces the amount of resin used for a part. According to Goralski, “a 4- or 5-mm wall will generally need done with structural foam. Thin walls would be maybe 1 to 2.5 mm thick, and, in that instance, you would be able to mold it conventionally.” Regardless of thickness, gas assist injection molding can eliminate chunks of resin within the part, and reduce the cooling times required. Manufacturing products faster with less material is a commonsense benefit, but there is another a major reason manufacturers use gas assist injection molding. With burgeoning markets for handheld devices and the constant drive for miniaturization, plastic parts today need to be smaller and more intricate than ever. As noted previously, however, conventional injection molding struggles with more complex designs. Gas assist injection molding can also eliminate added steps in the manufacturing chain, like welding or gluing, since it enables a molder to create a small, intricate piece in its entirety. One example Goralski shared involved a catheter for an R&D project. Catheters are small medical devices designed for insertion in the human body. Instead of making the tube and the catheter separately, which would require a separate process for adhesion, the manufacturer was able to mold the device all in one piece. While the piece was small (1.5 grams), the benefit of reducing cycle times and consolidating the process was huge. Nitrogen is used in gas assist injection molding because it is an inert gas. For the lion’s share of products manufactured today (and the resins used), a nitrogen purity level of 98 percent will suffice. As with any process, however, there are caveats. Every cycle of the plastic injection molding machine will use a specific quantity of nitrogen fed at a pressure ranging between 100 and 6000 psi (depending on the part). Traditionally, compressed air bottles used in conjunction with pneumatic boosters were used to feed the process. Unfortunately, that setup has a number of disadvantages: The pneumatic boosters, or piston pumps, require about 500 psi of inlet air; they cycle constantly; they generate a lot of heat; and they are maintenance intensive. One alternative to the pneumatic booster configuration was to purchase nitrogen from a supplier. The supplier delivers nitrogen in high-pressure storage bottles, typically stored on modular racks. This path, while easier to maintain, is not cost effective. According to Goralski, Bauer was one of the first companies to develop a nitrogen generator for the gas assist market. During his time at Bauer, he has replaced many pneumatic booster systems—and all the maintenance that goes along with them—with the SNGII™ Stationary Nitrogen Generation System (Figure 2). The SNGII is a standalone, turnkey solution capable of supplying 5000 to 6000 psi at purities up to 99.5 percent. Figure 2: Bauer Compressors developed the SNGII Stationary Nitrogen Generation System specifically for the gas assist injection molding market. Since compressed air contaminants like water vapor can seriously disrupt the operations of a plastics manufacturer, the SNGII comes equipped with its own rotary screw compressor. Complete with inlet air filtration, the air compressor feeds directly into permeable membranes at about 145 psi, thereby avoiding any contaminants that might lurk in a plant’s compressed air distribution piping. Once the proper nitrogen purity is achieved, nitrogen is sent to an integral Bauer high-pressure booster, which pumps nitrogen into storage cylinders. Integrated with a separate Bauer NCU (Nitrogen Control Unit), the SNGII generates and compresses the nitrogen to storage, while the NCU uses this stored gas to precisely control the plastic injection molding process. In addition, the SNII has an adjustable nitrogen purity levels, enabling flow optimization for different manufacturing processes. The unit’s PLC controls can modulate down to a 98 percent purity level to generate greater gas flow from the unit, lowering its run time. The SNGII is ideal for large operations running three or more gas assist injection molding jobs at their plant. 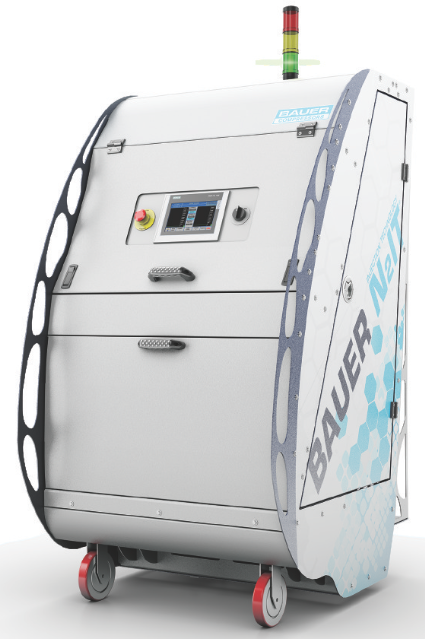 Bauer Compressors recently introduced another nitrogen generation solution, the N2IT™ Gas Assist Molding System, for smaller operations, where the company may not want to invest in the SNGII and separate controllers. Bauer Compressors presented the N2IT system at NPE 2015. Shown in Figure 3, the unit takes all of the nitrogen generation capabilities needed for the gas assist process, and puts it into one package, including a small compressor and a process controller. Requiring 100 psi of clean shop air at about 12 cfm, the N2IT is designed to work on one single gas assist injection molding process. Figure 3: With an integral controller, the Bauer N2IT can help smaller operations generate nitrogen for gas assist injection molding. The N2IT’s control system, featuring True Track Ramping™, is also unique. For the highest quality part, gas assist injection molding requires precise control of the nitrogen pressure. In the past, end users had no control over the nitrogen’s rate of pressure increase within the mold, which could be detrimental. True Track Ramping gradually increases or decreases the pressure into the mold at specific pressure set points. It can be particularly beneficial for parts with varying thicknesses—like a kayak paddle, as seen in Figure 4. Figure 4: Plastic kayak paddles have varying thicknesses, so precisely controlling nitrogen pressure into the mold can strengthen the part and improve it cosmetically. The experts at Bauer, who have been implementing gas assist injection molding for more than 20 years, are major proponents of the technology. With its many benefits, gas assist injection molding can improve part quality, reduce cycle times, and eliminate material waste. If integrating nitrogen generation into the conventional process is intimidating, Bauer’s expertise with gas assist injection molding, and nitrogen generation, can help overcome initial challenges. The SNGII and N2IT nitrogen generation systems are specifically designed for gas assist injection molding to help streamline the process. If you have any questions about gas assist injection molding, contact Rick Goralski, Bauer Plastics Technology Group, tel: (586) 247-1900, rick.goralski@bauerptg.com, or visit www.bauerptg.com.